This is a glorious recipe. It's exotic and warming from the seven spice mix, whilst also being light and lively from the mix of parsley, mint and dill that serenades each mouthful. Apart from making the spice mix, which you could do in a big batch and then keep in an airtight jar, this whole thing couldn't be more simple. 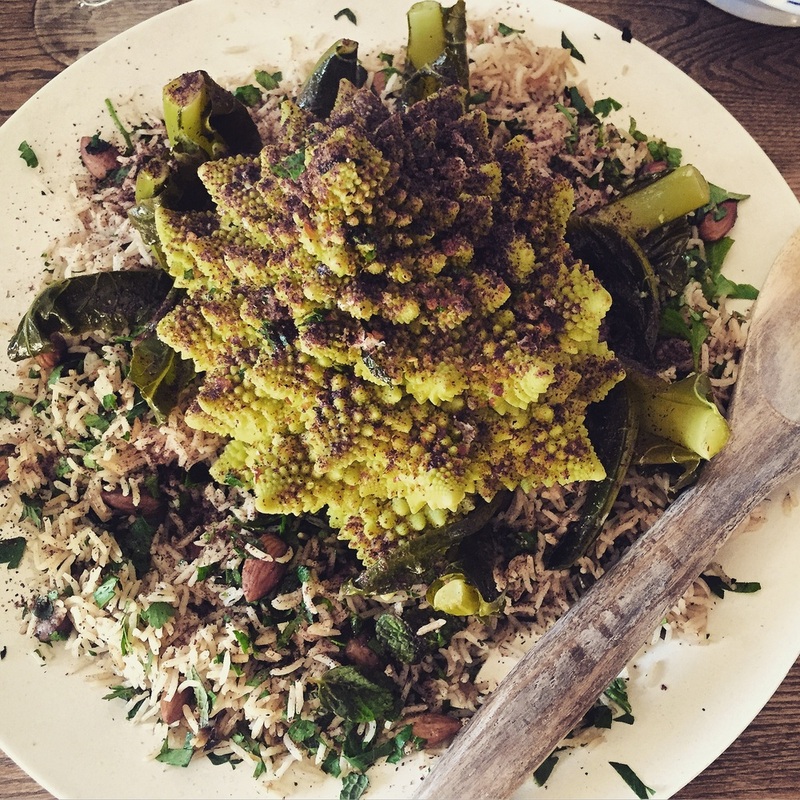 And on a miserable winter's day, there is nothing quite like the warmth of spices, the quiet hum of chilli and the welcome softness of perfectly cooked rice and romanesco. Soak the rice in cold water before you start cooking. This will remove some of the starch and make for perfectly cooked individual grains of rice in your finished pilaf. Make the cauliflower first. Place a pan large enough to fit the cauliflower over a medium heat and melt half the butter. Place the whole cauliflower in the pan and dot the remaining butter on top of the cauliflower. Sprinkle with salt and dried chilli and cover with a lid. Leave to quietly steam for 30-40 minutes. Occasionally check in on the cauliflower to baste with the buttery goodness in the bottom of the pan. Prepare the pilaf next. In a heavy-bottomed saucepan with a tightly fitting lid, melt the butter and fry the sliced onion very slowly with a very generous pinch of salt (enough to season the whole dish) for 15 minutes, then add the seven spice and cook for a further 5 minutes. When the onion is soft and sweet add the almonds and cook for a further 5 minutes. Turn up the heat under the onions, drain the soaking rice, and to the pan along with the cinnamon stick and dried chilli. Turn the rice over a couple of times to distribute the spices and onions throughout the dish, then cover with boiling water, make sure the liquid covers the rice by 2 cm. Check the seasoning. You want it to taste a little too salty. The rice will soak up a lot of flavour and under seasoning here will lead to an underwhelming pilaf. Cover with a piece of greaseproof paper and the lid, then cook on a high heat for exactly 4 minutes before turning the heat down to low and cooking or a further 6 minutes. Turn off the heat and leave undisturbed for another 10 minutes. This is crucial steaming time for perfectly cooked rice. Whilst you wait for the pilaf to steam to perfection, make the seasoned yoghurt. Crush the garlic clove with a little salt and mix it into the yoghurt. Remove the lid from the pilaf and fluff it with a fork before adding the herbs. 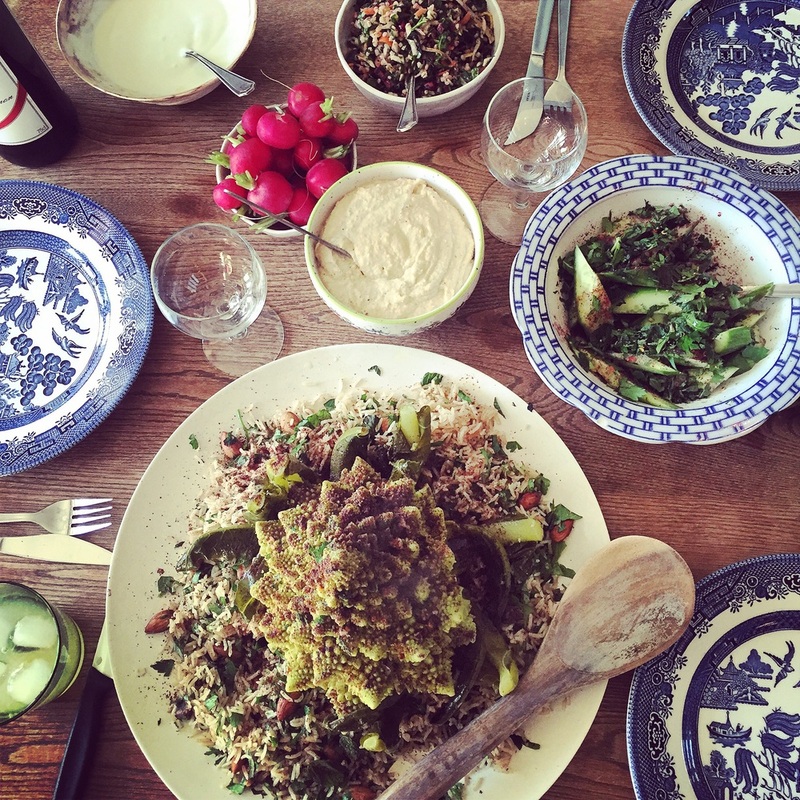 Transfer to a platter, sit the cauliflower on top, liberally scatter over the sumac, and eat immediately.